Google has announced an update to its popular Google Earth iPhone app. Version 2.0 lets users view personalized maps created on a desktop machine. The upgrade also adds 13 new languages to the mix, bringing a total of 31 supported languages. The original app was introduced a year ago, and quickly rose to the top of the App Store charts. Like the ubiquitous desktop version, it allows you to “fly” across the globe, touching down at the cities and locales you’ve chosen. You can indulge in panoramic views or check out the rooftop of your childhood home, all courtesy of highly-detailed satellite images. You can tilt your iPhone to view hilly topography and take advantage of the iPhone's location services to zoom into your current position. 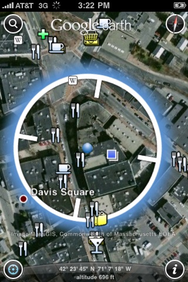 And of course, you can tap businesses on the map to find out what’s nearby. Google Earth 2.0 improves the way you select points of interest in your vicinity. Touching an icon causes it to glow, letting you know which one you’ve selected. That comes in handy when several icons are bunched together. If your finger hits more than one, they all glow, and you'll be taken to a screen where you can choose which one you want to read about. The big step forward for this edition of the app is the customized map feature. You can create these by using the My Maps interface on your computer. Google lets you take a satellite or map image and then add layers, which can include an itinerary, route lines, and other data. After you’ve saved the map, it becomes available on your phone. It’s easy to get too carried away with this virtual tourism: just remember, there’s no substitute for the smells and sounds of real places. Still, it’s not bad when you’re stuck at home. Google Earth 2.0 is free and available now from the iPhone App Store.